Northern Garrett High & Southern Garrett High would house grades 7-12. Route Forty, Grantsville, Friendsville, Crellin, and Yough Glades would house PK-6. Southern Middle would be renovated as a PK-6 educational space to house the Broad Ford community. Accident Elementary community would shift to the Northern Middle facility. In these two facilities, there would be space for Special Education, Head Start, Judy Center and other birth to 6th grade support & programming. Swan Meadow will be open and the grade band configuration will be further researched. Ms. Baker will also share the capital budget issues that impact the school system and outline some of the challenges and opportunities of both options on grade band alignment. Please remember that no decision has been made and there are still fact finding sessions being held. Before Ms. Baker’s presentation, PTO will share upcoming events and there will be information shared regarding Accident Elementary’s 2018-2019 initiatives. At the end of the evening Husky Pup Families will have the opportunity to submit questions, comments and concerns regarding the RISE plan. I appreciate the continued partnership with all stakeholders in educating our children. I look forward to our time together on Tuesday, October 30th. 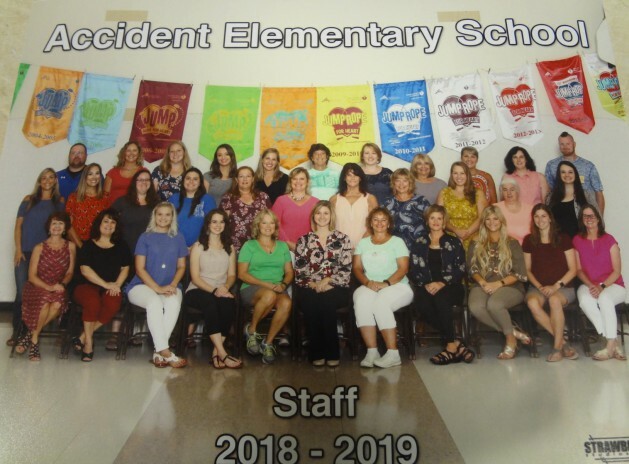 At Accident Elementary, students, staff, parents and community members work together to provide a safe, supportive and challenging environment to ensure all students have the necessary skills to be prepared for college and careers. In collaboration with parents and community members, it is our mission to provide students at Accident Elementary opportunities to develop 21st Century Skills such as collaboration and teamwork, critical thinking and problem solving, creativity and imagination, communication and compassion in a rigourous, relevant and safe environment.